Stanton County PPD is governed by a six member Board of Directors. 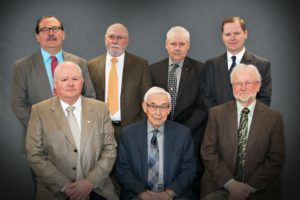 Each Director is elected to a six-year term. Board meetings are held the first Thursday following the fourth Monday of each month—unless otherwise specified—at the Stanton office, 807 Douglas Street in Stanton. Meetings from April through October begin at 7 p.m.; meetings from November through March begin at 9 a.m. These regular meetings are open to the public. If you plan to attend or wish to present anything before the Board, please let us know in advance by calling (402) 439-2228 so that we can get you on the agenda. John was appointed to the Board of Directors in December of 2012. His current term of office ends in 2022. John is a farmer. He and his wife, Donna, live outside of Stanton, in the Eagle Ridge subdivision. Bob was elected to the Board of Directors in November 2012. His current term of office ends in 2018. Bob is a retired farmer. he and his wife, Lynn, live in rural Stanton. Gary was appointed to the Board of Directors in March of 1988 and has been serving the last 29 years. His current term of office ends in 2020. Gary is a farmer and works in construction. He and his wife, Kathy, live in rural Pilger. Weldon was elected to the Board of Directors in January of 1987, and was recently recognized for his 30 years of dedicated service. His current term of office ends in 2020. Weldon is a retired farmer, and he resides in the City of Stanton. Jim was appointed to the Board of Directors in November of 1999, and has been serving the last 18 years. His current term of office ends in 2018. Jim is a farmer. he and his wife, Pam, live in rural Clarkson. Doug was elected to the Board of Directors in January of 2011. His current term of office ends in 2022. Doug is a farmer and a small business owner. Raised in Stanton County, Doug has farmed near Pilger for over 25 years. He is the father of two and grandfather to three.